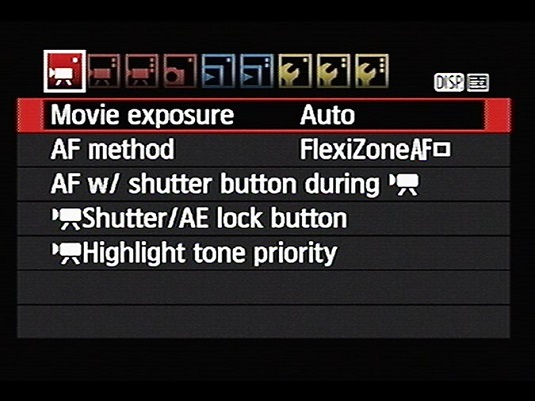 Movie Exposure: By default, this option is set to Auto, and the camera controls the aperture, shutter speed, and ISO. The selected settings appear at the bottom of the display. Set the Movie Exposure option to Auto to let the camera handle exposure duties. AF Method: This option enables you to choose from the same three autofocusing options available for Live View photography: FlexiZone-Single, (Face Detection) Live Mode, and Quick Mode. The T6/1300D doesn’t offer continuous autofocusing during movie recording. If you want to change the focus distance after recording begins, you can press the shutter button halfway to do so, but only if you have first enabled the AF with Shutter Button During Movie Recording option. You also can set the AF Method option via the Quick Control screen. AF with Shutter Button During Movie Recording: If you enable this option, you can press the shutter button halfway to reset autofocus during movie recording. But understand that doing so can be distracting. The image can drift in and out of focus, and the sound of the lens-focusing mechanism might be recorded if you use the internal microphone. Long story short, if you don’t want to use the same focusing distance for the entire movie, use manual focusing. Shutter/AE Lock button: This setting enables you to mess with the normal functions of the shutter button and the AE Lock button. Don’t.